Local wildlife and wildland activist offers alternative to bike park. A year’s worth of secretive, closed door meetings between Boise City and the J.A. and Kathryn Albertsons’ Family Foundation hatched a plan to construct an “All Skills” BMX style Bike Park in Boise’s Military Reserve. The City solicited no public comment or input before approving the foot hills Bike Park at a March 13 City Council Meeting with RES 105-18, effective that same night. Neighbors living immediately adjacent to the Reserve first heard about the scheme through a news article following the Council decision. They received no advance notice, and no opportunity to express concerns. 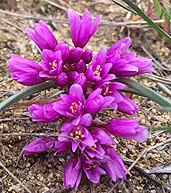 Aase’s onion, one of the rare plants that grows in Military Reserve. Military Reserve already sees a very high degree of human use. It is on the verge of being “loved to death”. There is an existing seven acre Dog Park, and a fenced Archery Range located in taxpayer-funded Flood Basins in lower Military Reserve. The Bike Park would displace the Dog Park. A shrunken Dog Park would be moved to the Archery Range site. The displaced Archery Range would be moved to undeveloped Open Space and wildlife habitat next to the historical Veterans Cemetery west of Mountain Cove Road. The Dog Park would shrink to less than half its current size, and cut into small and large dog zones, leaving no room for people to exercise larger dogs. A destination Bike Park and spillover effects would spawn increased disturbance to wildlife and rare plants in the Reserve. It would intensify conflicts between walkers/runners, people with dogs, bikes and wildlife that would extend over the entire Reserve, and impact safety on the much-used trails, and increase human-caused fire risk. It would mar the Core Reserve values of historical, natural area and open space for which the Reserve was established and for which Land and Water Conservation funds have been used to acquire land for inclusion in the Reserve. It would degrade the undeveloped and serene setting of the Cemetery, pioneering new development on the west side of Mountain Cove Road. On April 4th, The City finally held a pubic meeting. But it was not about the Reserve’s suitability for a Bike Park, or the impacts that inundation of the Reserve with increased use would have on core historical, natural and Open Space values. Instead, the focus was on what “amenities” should be built in the shrunken Dog Park. Folks attending the meeting were handed blue sticky dots to put on displays of plastic dog hoops. There was no display that said: “Keep the Dog Park and Archery Range in the Flood Control Basins at their Current Locations – Find a Different Place for a Bike Park”. In years past, dog advocates had asked the City about upgrading the Dog Park and were told emphatically No. We can’t put structures in Flood Basins. The Basins were built at taxpayer expense following fires or runoff events – a 1950s mudflow and the 1996 Foothills/Tracer Bullet Fire. Scientists say such events are likely in the future. Federal funds have also been used for habitat work and other projects in Military Reserve aimed at conservation. Traffic in the area is already snarled following St. Luke’s City takeover of Jefferson Street. Increased human-caused fire risk is a major concern. Houses surround eastern and western areas of Military Reserve. HERE is a link to my detailed screed. HERE is a link to the City Resolution. Money talks. Joe Scott gets whatever he wants with his inherited money. He never made a dime of it. Thanks to the Guardian for publishing this! A friend reminded me this afternoon of a group of volunteers called Friends of Military Reserve. They stopped the City/ACHD from caving to Simplot paving Mountain Cove road through Military Reserve to access land for development. Kudos for their efforts. Seems like its time for folks to band together again and protect this area. The rudest of drivers have a bikerack on the car, why do you think they give a crap about a plant. Many thanks to Ms. Fite and the Guardian for publishing this very informative piece! Kind of ironic that this exact location was a BMX style bike park before it was a dog park. My friends and I used to ride there all the time back in the 90’s. More Olympic talent, from Boise, coming to the World soon. Yes and the old BMX style Bike site (nothing like what is now proposed) was MOVED because the City insisted there could be NOTHING built/no structures in the Flood Basins. This is recorded in the 1998 Plan for the area. And 1998 was a far different time than now … with Bieter trying to turn the city into a commercial type mecca for any and all interests and development. Why else do you think Albertson’s is funding it? This project looked like a foregone conclusion at the start and the farce of a public meeting only served to appease the public. Can Friends of Military Reserve actually do anything now that the public officials have been bought off? I’m so disgusted with this process.